Any application such as pants, skirts, dresses and handbags where only one end needs to open sufficiently to allow entry. Usually used in jackets, tarps and some handbags where both sides must separate completely. Not a finished zipper, just the teeth on tape in running yardage. Sliders with pulls and stops are purchased separately. Cannot be retrofitted to a separating configuration. Used for upholstery and garment construction where the sewer can determine desired lengths as needed. Important! The measurement of a fixed length zipper (not chain) is taken from stop to stop. Tape lengths may vary from zipper to zipper, so this is a vital measurement. Stops will be nickel unless specified differently in a custom order. They are meant to stop the slider from pulling off the teeth. This is the end that is suitable to shorten on a separating zipper. Make sure to pull the slider down and re-attach stops, sew thread stops or tuck zipper ends into a facing before pulling slider back up. The tape that extends beyond the teeth is generally ½” to ¾” long unless specified differently in a custom order. 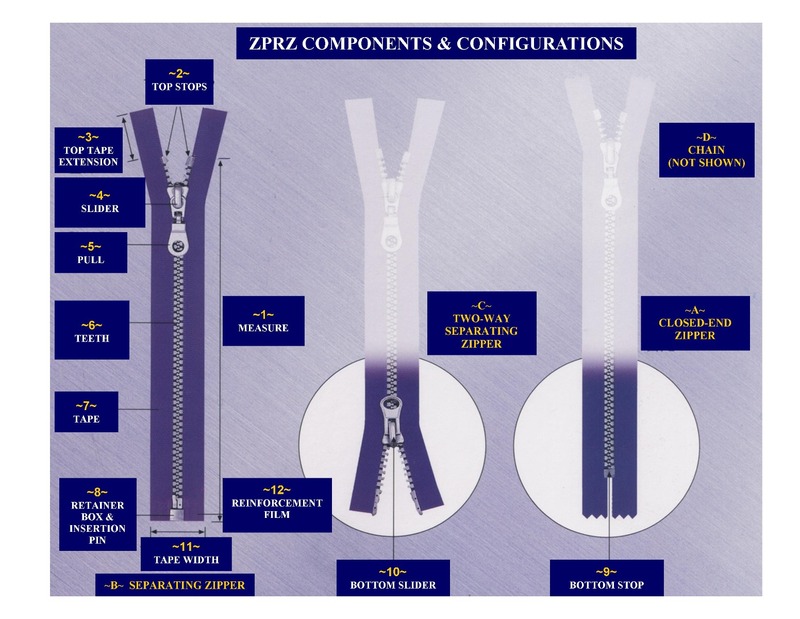 Regardless, one should never consider the extension as part of the zipper length as it will always vary to some extent in the manufacturing process. The slider is what separates and joins the teeth and the sliders are engineered to operate only one type and brand of teeth. a) Auto-lock: Slider locks in place wherever it is stopped along the teeth surface. Very important for pants and skirts. b) Non-lock: Slider does not lock at all and pulling both tape sides away from each other will make the slider move. A pull is the gripping device that pulls the slider. New designs have taken the pull from just a utilitarian device to a designer accent. Teeth are the interlocking devices along both tapes that join with the aid of the slider. a) Coil: Sometimes called “Nylon” the teeth are actually made of polyester and may be mixed with metallic for a fashionable look. They are stocked in sizes 3 to 10 with uses ranging from apparel to boat tarps. Since coil zippers are the most pliable, they are popular for areas where they go around a curve, as in handbags and pillows. Coils come in the classic exposed teeth configuration, veiled (invisible) and inverse (reverse) teeth. b) Plastic: Liquid plastic is molded on the zipper tape, thus they are also called “molded” zippers. They are stocked in sizes 3 to 10 with uses ranging from apparel to boat tarps. New innovations of mixing colors, printing on top of the teeth or adding mirror finishes make plastic zippers fun accents to many projects. c) Rhinestone: “A” clarity lead-crystal stones are imbedded in the plastic teeth – not just glued in. Note that this is the only zprz product that has a lead content and is not approved for children’s wear. d) Metal: Teeth stamped out of either aluminum or brass. The brass teeth come in a variety of finishes, all lead-free and nickel-free. They are stocked in sizes 1 to 15 with uses ranging from apparel to industrial applications. Fashionable Euro-inspired metals are smooth to the touch. All teeth come on standard polyester tape. Some styles are also available in 100% cotton pfd (prepared-for-dye), polyester satin, nylon knit, nylon knit lace, stripes and metallic. The bottom closures for a separating zipper, the retainer box is in the right hand and the insertion pin is in the left hand and will be the color of the teeth unless specified otherwise in a custom order. The bottom closure for a closed-end zipper and will be nickel unless specified otherwise in a custom order. This is the secondary slider in a two-way separating zipper. The bottom slider may open and allow ease to a jacket wearer while still keeping the top of the zipper closed. Width will vary depending upon the gauge (width) of the teeth. Example: Size 5 teeth will have a standard width of approximately 1¼”. The factory can produce custom widths to manufacturers’ specifications. A perforated and plasticized film coating the bottom edges of a separating zipper by the retainer box and insertion pin to insure the tape does not ravel during repeated use. The perforations allow stitches to be sewn through the film.